Today I want to write about an elegant, beautiful animal called the gerenuk. These lovely looking antelopes grow to about 1.5 metres tall. The males are larger and heavier than the females. 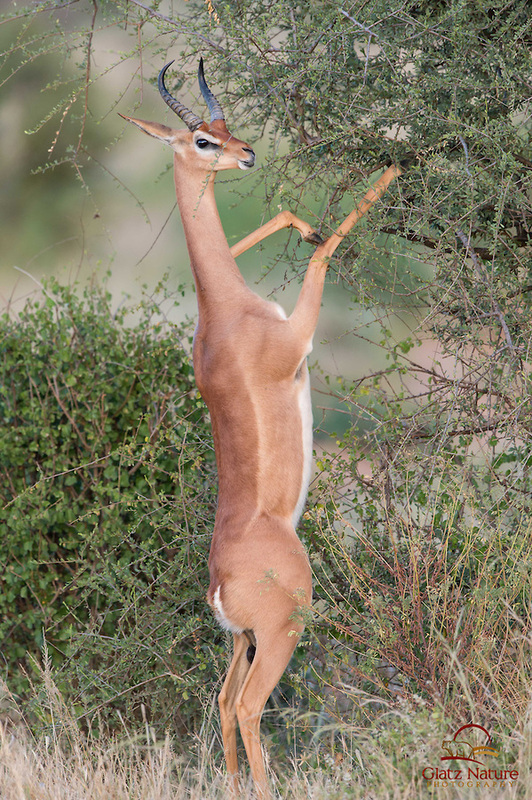 The word gerenuk means “giraffe-necked” in the Somali language and it’s easy to see why. They have very flexible hips and use their long neck to reach up and eat the soft leaves, shoots and buds that most other plant eaters can’t reach. Even though they live in very dry areas, gerenuks never drink water, getting all of the moisture that they need from the leaves that they eat. Only the males grow horns and they use them to defend their territory from other males. The females don’t have a territory and can breed all year round. Gerenuks live in the desert regions of Djibouti, Somalia, Ethiopia, Kenya and Tanzania. Their numbers have dropped due to habitat loss, but they are still fairly common. Are there any other interesting facts that you would like to share about gerenuks?